Pruning Japanese maple trees is extremely important to ensure their health. Get the proper guidelines of how to go about the task of pruning. Japanese maple trees are amongst the most popular oriental tree varieties. The use of these trees is widespread in Japan, Korea and China. During the 1800s this Asian tree was introduced in the United States and England. The Japanese maple has many varieties with the biggest of them stretching over fifty feet and the smallest of them coming in the bonsai category. The maple trees are excellent for landscaping purposes and at the same time they make great container plants. The colour range varies from purple, yellow and green. The beautiful Japanese trees need careful nurturing for them to turn out successful. Constant pruning is vital to ensure a healthy formation. The pruning process goes on only for a couple of years after which the trees can take care of themselves unless of course you are planning to grow a bonsai. The pruning process is to be conducted during the early years of the Japanese maple tree. Once the young trees are provided with the initial care they grow up to become big and beautiful trees that last a life time. Just like every job requires its own set of tools there are a couple of things you will need to conduct the pruning of Japanese maple trees. Your tool kit should consist of pruning sheers which is the most important tool. You should also have some bleach and pruning sealant to perform the duty. You will have to start off by checking the tree and making a plan. 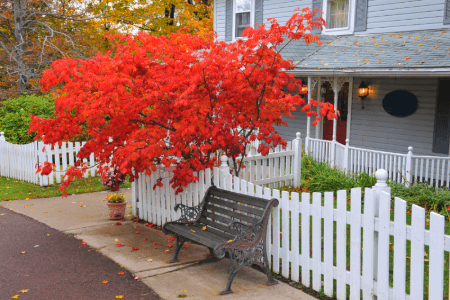 The fall or winter season is ideal for pruning the Japanese maple tree. Check the tree for damaged and weak branches and locate those branches that are rubbing too close to each other. If the pruning load is too much then it would be wise to space out your pruning task over a period of time rather than taking the entire burden on your self in one go. You must exercise caution and not go overboard in your pruning efforts. If you prune more than one third of the tree in one go then the tree will actually become vulnerable to rot. The sick and weak branches demand first hand attention. Make sure your pruning sheers are sharp. Dipping them into the bleach will ensure that no plant diseases are transferred on to the tree. You should make nice clean cuts and avoid twisting and snapping the branches. Seal the cuts using a sealant which is easily available at local nurseries. The use of the sealant prevents them from bleeding while keeping them safe from harmful bugs and diseases. You should check the wounds to see if they have been completely sealed after 24 hours. Apply more sealant if required. It is quite likely that you will not be able to accomplish the complete pruning requirements of your Japanese maple tree in one sitting. Get done with those areas that require urgent attention first and leave the rest for next year.